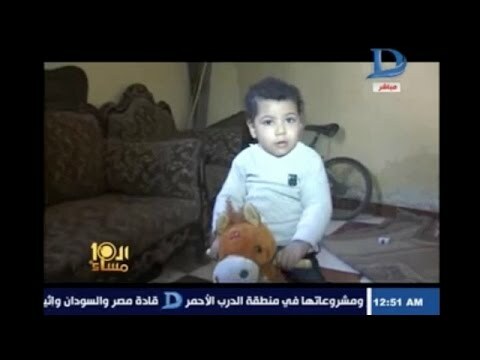 (Beirut) – A life sentence apparently handed down by mistake to a 3-year-old boy on February 16, 2016, exemplifies the arbitrariness of Egyptian courts that are used to punish political opponents of the government. A Cairo military court presiding over a mass trial of 116 defendants, including Ahmed Mansour Qurni Sharara, 3, delivered the sentence after investigators and prosecutors failed to remove Mansour’s name, even though they knew it was included by mistake, a lawyer for the defense team told Human Rights Watch. All 116 defendants received life sentences, though only 16 were in custody, not including Mansour. The defendants have one opportunity to appeal the verdict, to a military appeals court. Believing that Mansour was an adult, police went to the family’s home in 2014 to arrest him in connection with a protest, the defense lawyer said. When Mansour’s father, Mansour Qurni Ahmed Ali, told them that the person they wanted was his young son, they did not believe him, so he presented his son, along with a birth certificate viewed by Human Rights Watch. The police arrested the father instead and held him for four months. In response to media scrutiny, the authorities have offered incomplete explanations. A spokesman for the armed forces said in a statement posted on Facebook on February 21, that the person listed in the case was not the 3-year-old, but a 16-year-old student whom police had tried to arrest in 2014 but who had fled. The spokesman did not explain why police in 2014 had gone to the 3-year-old’s home or arrested his father. Major General Abu Bakr Abd al-Karim, a spokesman for the Interior Ministry, said in a phone call during a televised studio interview with the father and son on February 20, that the 16-year-old was the boy’s uncle. But the father said that the uncle was 52 years old. The boy’s mother, who also called in during the televised interview, said that police had come to the family house again that day to arrest the father and son. The case stemmed from a January 2014 anti-government protest in Fayoum, 65 miles south of Cairo, that authorities blamed on supporters of the Muslim Brotherhood. Security forces dispersed the protesters with teargas and live ammunition, killing a 52-year-old teacher, an 18-year-old student, and a 28-year-old construction worker. Several people were wounded. Following the incident, National Security officers of the Interior Ministry recommended charges – approved by civilian prosecutors – against a seemingly random assortment of Fayoum residents, including the brothers of two of the dead protesters, a deceased man, and a man who was not in the country at the time, a human rights lawyer who researched the case told Human Rights Watch. All 116 defendants faced allegations of killing the three slain protesters, attempting to kill eight others, and deliberately destroying government property, according to the charging document seen by Human Rights Watch. The document also accused the defendants of using force and violence against government employees, including the army and police. Egyptian civilian prosecutors have retroactively transferred thousands of civilians to military trials since October 2014, when President Abdelfattah al-Sisi issued a decree vastly expanding military court jurisdiction. The decree, Law 136 for the Securing and Protection of Public and Vital Facilities, allows military courts to try any crime committed on “public” or “vital” property, including electricity stations, gas pipelines, oil wells, railroads, road networks, bridges, public universities, and any similar state-owned property. Article 111 of Egypt’s Child Law (2008) prohibits the sentencing of children to life imprisonment, death, or forced labor; the law also raised the minimum age of criminal responsibility from seven to 12 years. The expert committee that interprets and monitors state compliance with the United Nations Convention on the Rights of the Child, to which Egypt is a state party, has urged Egypt to “ensure that children are never brought before and prosecuted under the military justice system and to ensure that any sentence handed down to children by military courts be considered null and void,” in accordance with their rights in juvenile justice. Egypt’s military courts operate under the authority of the Defense Ministry, not the civilian judicial authorities. The judges are serving military officers. Military court proceedings typically do not protect basic due process rights or satisfy the requirements of independence and impartiality of courts of law. Children can also face charges before military courts, which Human Rights Watch opposes in all circumstances. Though Egypt’s constitution allows military court trials for civilians, the practice violates international law, including the 1981 African Charter on Human and Peoples’ Rights, which Egypt’s parliament ratified in 1984. The African Commission on Human and Peoples’ Rights has stated that civilians should never face military trial.